Another good sign of how a car has been cared for is its trim. Vinyl-trimmed interior barely has space for four, even with the hood down. It is a genuine Spider, a two-seater. 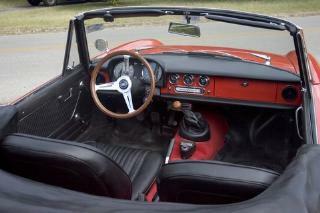 Check the upholstery: if it's bad, you may need to refurbish the whole interior. The vinyl interior came in four colors, black, purple, red and beige or tan. Check that the little components are present, because some are expensive to replace or even impossible. Well, not quite, but they cost. In particular, check the dashboard carefully if the car in question is a right-hand drive, these dashboards are now unavailable, as far as I know. The chromework on the older Alfas 1966 to say 1974 is excellent. Bumpers are still in good condition even after ten to twenty years or more. Some of the later cars have dreadful chrome. The base metal is so poor that pitting is inevitable. This is sometimes the case with the chromed attaching points for the hardtop. The front suspension, with an unusual amount of expensive forging, must have been designed for use on Italian back roads. It is very solid and problems are rare. 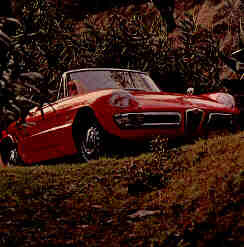 The same system was used on the other 105-series cars by Alfa Romeo. The steering is normally most precise, but if there is some play, the tie-rod ends need to be replaced. This is easy work for the DIY, but remember to have someone else double-check the steering after repair. Alfas came with worm and roller or re-circulating ball. The Alfa Romeo twin-cam light alloy engines are well known for their sweet, punchy and responsive performance. Check the engine type too. Durability is a well earned reputation. When buying a Spider, always check the car with a cold engine. Every bad sound will sound even worse when the engine is cold. I.e. ticking valves, worn bearings, the gearbox, in fact everything. To check a possible object under hard conditions, drive the car when it's cold. See if the gears all shift nicely. Listen and make sure it doesn't stumble or spit or backfire. Blue smoke is common and will cost new piston rings.All of these are bad and suggest it is in need for repairs. Euro cars have carbs by Weber or Dell'Orto, some even have Solex. US had thanx to emission regulations SPICA pumps. Tell the seller not to start the car before you get there and when you get there, open the hood, put your hand down and feel the motor and the exhaust. If it's warm, leave the hood open to cool it down a few hours. However, the aluminum alloy blocks do need tender love and care. Once the Spider is yours, warm up the engine before driving under pressure or high revs. Let the engine idle some minutes before take off. It will help you keep the engine and the car in good shape for a long period of time. Do not rev more than 2.500 rpm during the first 5 kilometers or 3 miles. The more care you take during warming up the engine, the less problems you will have. BTW, the engine sump will take 11.6 pints or 6,5 liters of quality oil, so it is very big! The four-cylinder all-alloy engine features overhead twin cams, wet liners, sodium-cooled exhaust valves of large dimensions, large sump in alloy. Alfa's hemispherical combustion chambers offer centrally located spark plugs and extremely short intake and exhaust ports. Most of the water pump's output is delivered through long slots in the exhaust port area. The all aluminum block weighs just 40 pounds or ten kilos, studs and all. It accepts four cast iron cylinder barrels, liners, with pop-up pistons and well designed rods. The crank is fully counterweighted, reducing the loads at the main bearing web. These tall main bearing caps and long studs complete a sturdy, solid bottom end. The oil-pump is a two gear affair, more rugged than internal gear pumps. The sump has an elaborate series of baffles to help retain the oil in the pick-up area during hard cornering. The sump is extensively finned. No problems there. Do not forget the tune up history. Was it maintained by a reputable Alfa repair shop? Check with you AROC-friends. Did the owner maintain it? If so, does he or she have records indicating when things like when the oil was changed, spark plugs and that sort of thing. Do not forget to look for excessive amount of oil in and around the engine compartment and on the hood, this will point to an older motor that may be in need of repair. Do not be afraid of a little oil build up, this is normal for an all aluminum motor. Things need to be tightened a little bit every month or so. Check that the block is not cracked or corroded. Head gaskets are another common failure point, plus the "O" rings under the camshaft bearings. Look for traces of oil down the side of the block from the head. If so, the head may be checked for flatness and the "O" rings replaced together with the gasket. Oil traces in the air cleaner indicate worn piston rings, not a serious problem for the skilled Alfista. Read how to replace them nice and easy with the engine in the bay. The cooling system is quite large and very solid. Some owners have modified and improved it. Read more here. In the transmission department, there are few problems to worry about. In case the synchros need some attention or replacement, the gearbox might be removed from underneath with the engine still in the bay. This procedure is common for any garage where they replace the clutch friction pads. Rugged gearbox offers evenly balanced acceleration and cruising through a careful choice of ratios. Fifth gear, not an overdrive, as standard, was something to shout about in 1966 when most cars only had three or four gears. All gears were syncro, but the second syncro might be worn on high mileage cars. Check gears again when the engine and gearbox are warm. The clutch by Fichtel & Sachs is operated hydraulically and most solid. Propshaft universal-joints, "doughnuts", can often loosen, producing a knocking sound from under the floor. This is annoying, but it isn't a serious problem, easy and cheap to solve. Suspension systems are very strong, but check the rear end for sagging. Look at the bump stops, if the rubber is worn or even missing, the springs are probably worn. Any tuning company offers shock absorbers. Yellow Konis are popular among Alfisti. Cars with single circuit brake system use floor pedals, that was between 1966 to 1969. Only a few Duetto have a brake servo. 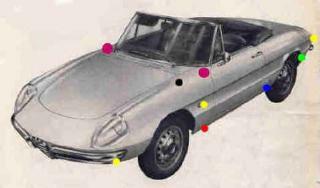 The 1750 Spider Veloce started with a single circuit, but came with a twin booster very soon. Check for soft brake pedal because, if there are leaks, rebuilding the braking set-up can be long and arduous. Brake master cylinder on floor pedal system are sometimes hard to find. Check the brakes like this. The Spider came with hanging pedals in 1969. Long-lasting exhaust systems come in sections. If you spot a hole, replace the section instead of the whole system. Stainless steel system was not an Alfa fitment nut are common in Europe. Although the Spider is not as fragile as some other Alfa Romeos are, it does need looking after. Unfortunately, older cars are likely to have had less-than-scrupulous owners taking care of them. This makes a careful check-over all the more important. Engage the service of an inspection specialist if you are serious about a Spider and you won't be disappointed. The prospect of coping with a bad one, though, Spider is far more daunting. Because of the high European prices and the sheer number of cars in the US, importing a Spider from the States can be economic. Their fuel-injected engines easily identify American Spiders by SPICA, extra lightning and federal bumpers. Converting a SPICA engine to Webers is common, but if the fuel injection works OK, why bother? •Rust at jacking points. Red dot. Feel the edges of the sills all the way, even underneath. If they feel pitchy, check even more. •Lift carpets to check floor for rust. Have a glance behind and under the seats too. Lift the rubber carpet behind the seats and hood. Check wheel arches for rust. Again, use your fingertips. The edges should feel clean and smooth without any pitches. Rear wings are notorious water-traps, check for rust, even from underneath. Green dot. Boot floor, around tank and spare wells, another rust spot. Lift the entire rubber math and look under it. Front panels, upper part close to doors, also a rust spot. Purple dots. Lower area between door and rear wheel, rust spot close to the farina badge. Blue dot. Missing or damaged headlamp cowls. Later US cars did not have them. Rear bumper stops for sagging rear suspension. Check both sides for the rubber dumber, fixed to the body just above the ends of the live rear axle. Dashboard for cracks. RHD dashboards are hard to replace. Interior and instruments. Jaeger gauges are what you should have in a Spider. Engine for cracks and leaks. Oil leaks between head and block indicate you will need a new gasket before long. As with any Alfa Romeo engine, blue smoke when accelerating and stopping, tells you to check the engine at your Alfa garage. Second gear syncro. Common on anyAlfa. Hood, sturdy but might be costly to replace. Came in black and tan and was easy to handle by one person. The Spiders also had a hood-bag as an option. Rearview mirror at front panel instead of door tells you that it's an old Spider. Black dot. If it has, you are facing a Duetto or an early 1750 Veloce. . . lucky you! If you find a Spider and you like it, buy it and have fun and join your local AROC!